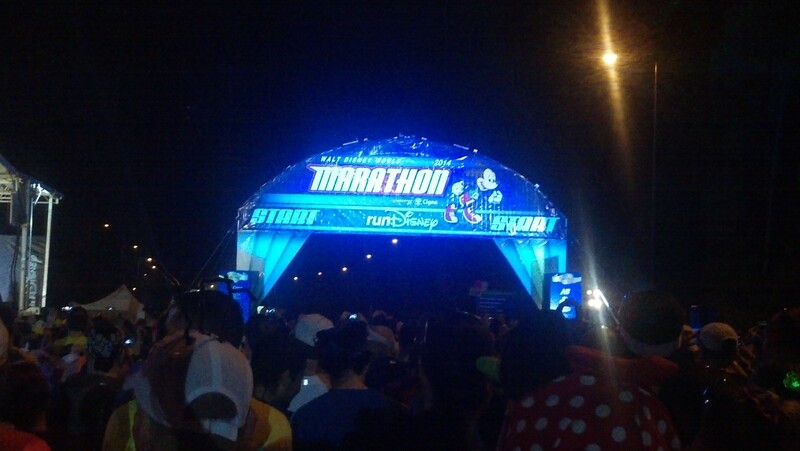 2015 Walt Disney World Marathon Weekend Corrals Released! The 2015 Walt Disney World Marathon Weekend is less than a month away! I remember what it was like last year when I was this close to the race weekend. For those who are travelling out to Walt Disney World to run in the races, this is a really exciting day. It’s the day that the corrals have been released! This is the day where you get to see how close to the start, or how far away from the back of the pack you rank. If you’re a back of the packer, like myself, this is the day where you see how much of a buffer you might get from the ever dreaded balloon ladies and the sweeper buses. So, without further ado, here are the corrals. Are you one of those crazy people who are running all of the Walt Disney World Marathon Weekend races? Are you Dopey? Here is how the folks that are taking on the Dopey Challenge (5K, 10K, Half Marathon, Full Marathon on 4 consecutive days) are seeded. Are you only half as crazy as the Dopey folks? Are you Goofy? If so, here are how the corrals are seeded for you Goofy people. If you’re not familiar with this challenge, it’s the 10th year of the Goofy’s Race and a Half Challenge. These people will be running the Walt Disney World Half Marathon and Walt Disney World Marathon on back to back days….39.3 miles in 2 days. Next up are those who are “only” doing a marathon. If you’re running in the 2015 Walt Disney World Marathon and haven’t taken on the crazy challenges, this is how you will be seeded. I put these three seeding sets together because you’ll notice some similarities. The time required is the same for all three groups of people. If you are projecting to run a Marathon in 3 hours, 30 seconds, or less, you’ll be in corrals A, B, or C. The 3 hour, 30 second time is the cutoff for corral C. So, as you can see, the Dopey and Goofy seeding sets are all based on projected Marathon finish. 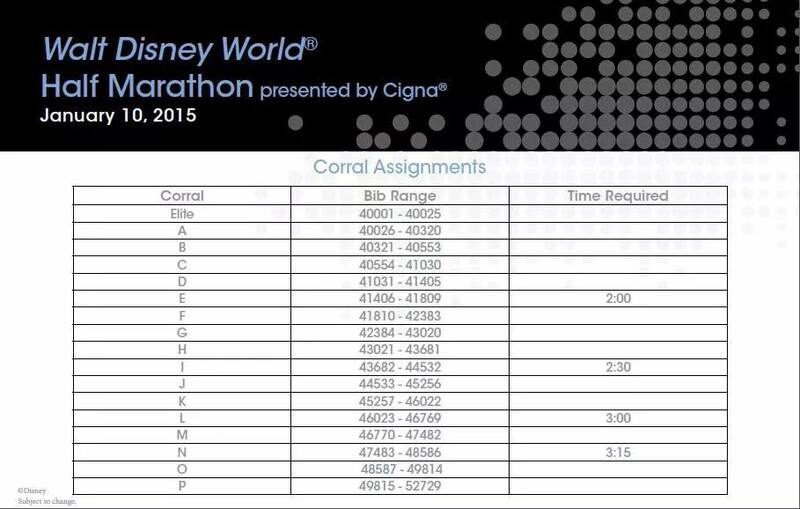 Here are the Walt Disney World Half Marathon corrals. This is for people who are “only” running the half marathon (or are running the half marathon and other races, but not apart of the two challenges). The time requirements are for the half marathon distance only. 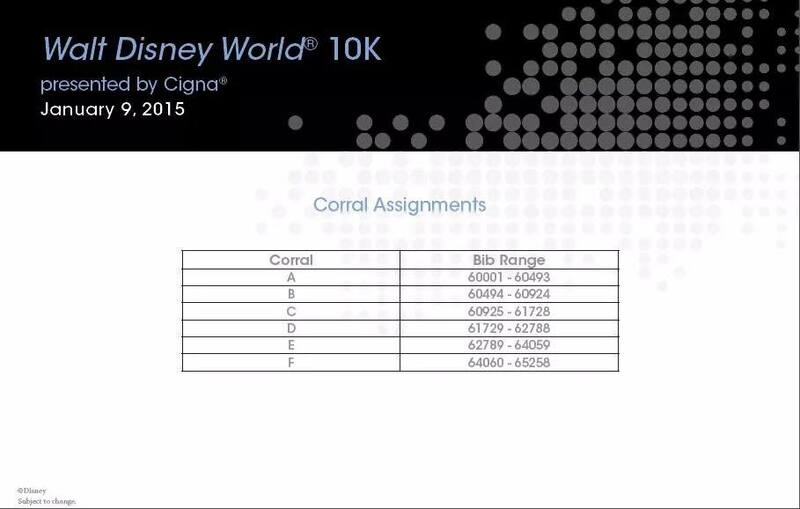 Last, but certainly not least, here is the corral assignments for the Walt Disney World 10K. Again, this seeding is for those who are running the Walt Disney World 10K only (or may be running other races, but not apart of a challenge). In this seeding, we don’t see any projected finishes. I would guess that if you are running the Dopey Challenge, you will have two different Corral letters on your bib. 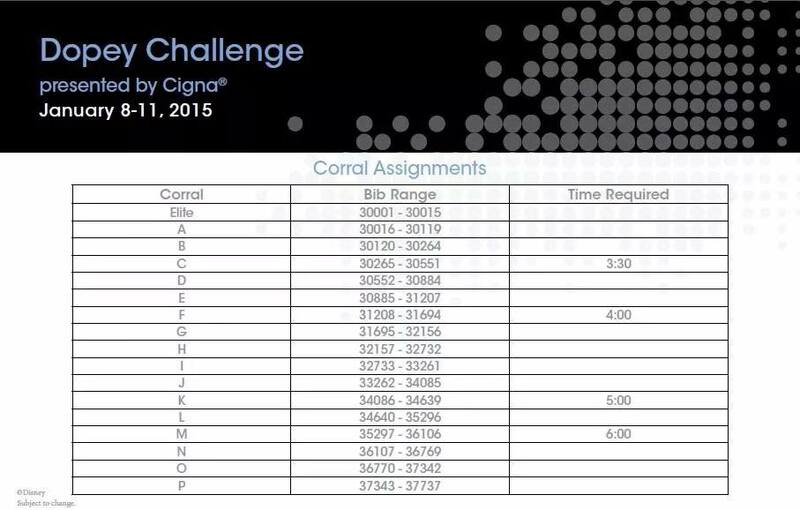 One corral letter will be your seeding in the 5K and 10K races. The other will be for the half marathon and full marathon. As you can see, the corrals for the half marathon and full marathon run through corral P and the corrals for the 10K are only through F.
This year, for the Walt Disney World Marathon, I was in corral L. I gave Track Shack my 2013 Rock n Roll Los Angeles Half Marathon time of 2:43:25 to calculate my seeding for the 2014 Walt Disney World Marathon. According to some of the race calculators online, my projected finish for the Marathon would have been around 5 hours, 43 minutes. That would have placed me in corral M if I were to race this year. So, I would have been one corral closer to the back. It just goes to show that each year the seeding will be different. 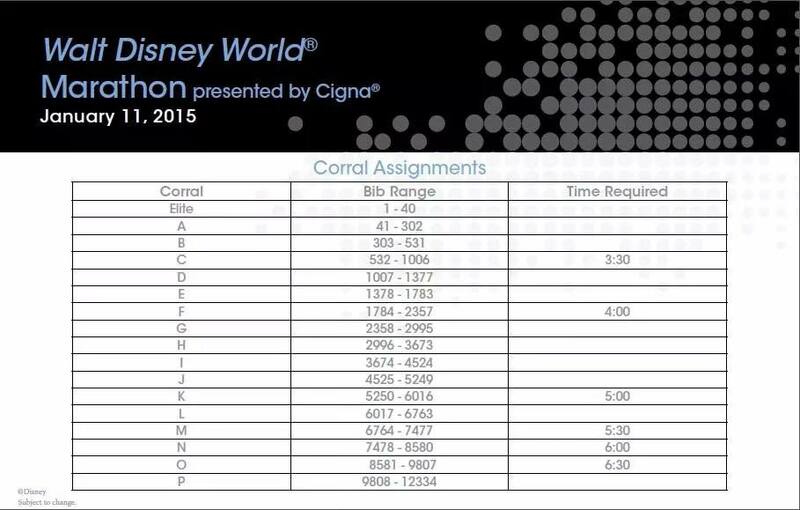 The folks at runDisney seed the corrals according to who is racing and their estimated finish times. So, you might have the same projected finish time for the same race in two separate years and find yourself in different corrals each year. 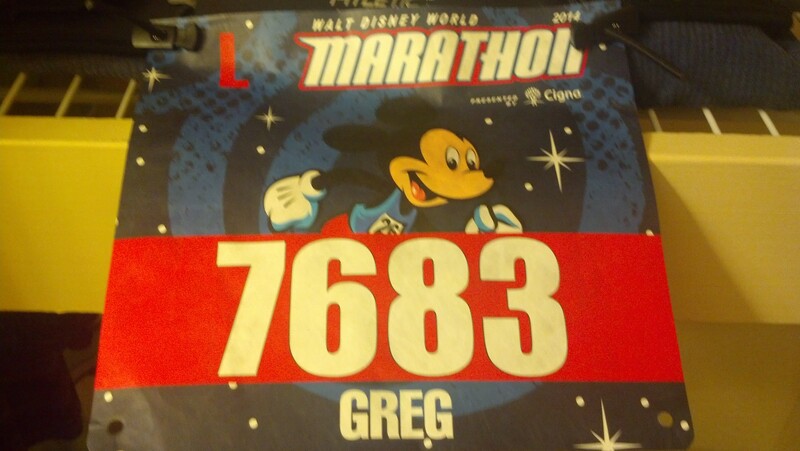 If you’re interested in how the seeding worked out for the 2014 Walt Disney World Marathon, check out my blog post from almost one year ago here. 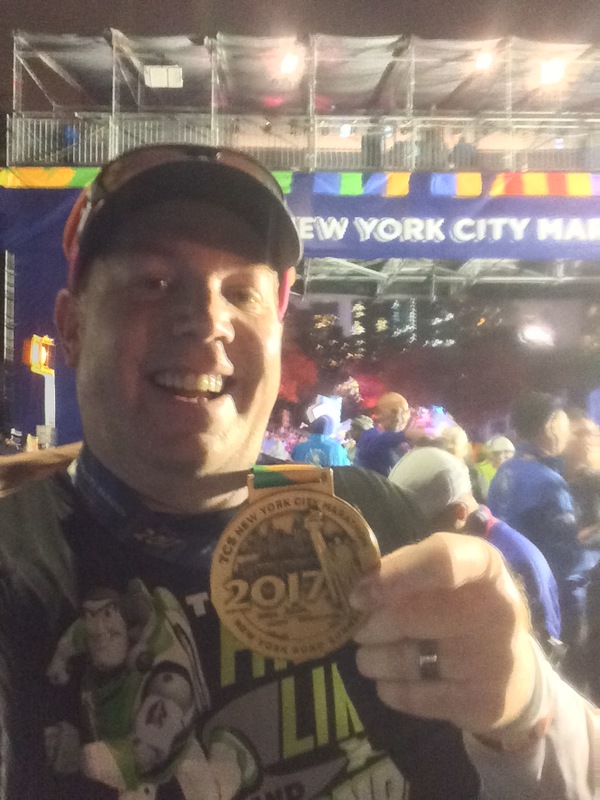 Also, if you want to read about my experiences, click on the Walt Disney World Marathon tab at the top of this blog page. I have the whole trip in one easy to find location. So, if you’re running at Walt Disney World for the races this coming January, are you happy with your seeding? For those of you who are heading out to Walt Disney World this January, I wish you all the best of luck with your races and final preparations. Seeing the corrals for the Walt Disney World Marathon is exciting for me because it means that the corrals for the Star Wars Half Marathon Weekend races must be coming soon! Hopefully, by this time next week, I’ll know where I’m seeded. I’m also hoping that runDisney will announce soon the race course for the Star Wars Half Marathon and Star Wars 10K. It’s just so hard to wait. Are You Thinking About Your Goals (or Resolutions) for 2015? Reblogged this on DoomBuggy Runner. I’m so excited that corrals are out! Im in corral H for Dopey so Im pretty happy. I will most likely be corral B for the 5k and 10k which should also be fine! Star wars should be out next week and I’m excited! I hope all goes well with all those Dopey runs. Waking up that early 4 mornings in a row might just be the most difficult part. At least that’s what I kept hearing last year. I can’t wait to see the Star Wars details as well! I loved the race guide for the Avengers Half. If that’s any indication, the Star Wars race guide is going to be off the hook! I will be “only” running the full. My first one! Well that and the 10k. I am pretty happy with my corral placement. Now, I just can’t wait to see the details about Star Wars. Hope that comes out next week. Especially the course! Looks like you’re doing exactly what I did this year at the WDW Marathon Weekend. I ran in the 10K and the Full Marathon (my first full marathon)! I’m hoping that runDisney improved their 10K course entertainment from last year. Enjoy all that the weekend has for you. The WDW Marathon is a great first full marathon to run! I can’t wait to see the Star Wars details as well! Can it be next week already?